We’d love your help. 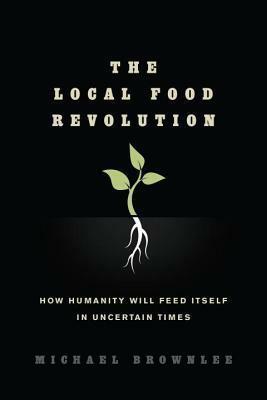 Let us know what’s wrong with this preview of The Local Food Revolution by Michael Brownlee. Demonstrating that humanity faces an imminent and prolonged global food crisis, Michael Brownlee issues a clarion call and manifesto for a revolutionary movement to localize the global food supply. He lays out a practical guide for those who hope to navigate the challenging process of shaping the local or regional food system, providing a roadmap for embarking on the proce Demonstrating that humanity faces an imminent and prolonged global food crisis, Michael Brownlee issues a clarion call and manifesto for a revolutionary movement to localize the global food supply. He lays out a practical guide for those who hope to navigate the challenging process of shaping the local or regional food system, providing a roadmap for embarking on the process of righting the profoundly unsustainable and already-failing global industrialized food system. Written to inform, inspire, and empower anyone farmers or ranchers, community gardeners, aspiring food entrepreneurs, supply chain venturers, commercial food buyers, restaurateurs, investors, community food activists, non-profit agencies, policy makers, or local government leaders who hopes to be a catalyst for change, this book provides a blueprint for economic action, with specific suggestions that make the process more conscious and deliberate. To ask other readers questions about The Local Food Revolution, please sign up. Path-finders. Way-showers. Ah, this one reads like the stories told round the cabin up the steep, snowy regions of new territory. Clearly, the path includes a lot of not knowing where or what the next step. Clearly, only one thing is necessary in order to continue: a clear mandate, a sense of "must" about this task of opening up the discussion: Do you know where your next meal is coming from? Seriously, if the trucks could not make it over the mountain for a matter of ... days or months, how wou Path-finders. Way-showers. Ah, this one reads like the stories told round the cabin up the steep, snowy regions of new territory. Clearly, the path includes a lot of not knowing where or what the next step. Clearly, only one thing is necessary in order to continue: a clear mandate, a sense of "must" about this task of opening up the discussion: Do you know where your next meal is coming from? Seriously, if the trucks could not make it over the mountain for a matter of ... days or months, how would the people eat? Couldn't finis this book. It started so good and I thought was going to be a great manifesto of their work to create an urban food system, but it turned into a "Doomsday Prepper" book about how with Peak Oil and Climate Change, we are going to live under the ground, etc. I know eventually it would get to the parts that would discuss what I want, but it was just too "end of the world" for my liking.